Hey there, this is my project. It is almost finished. Just have to redo the exhaust, make some handlebars and some other loose ends, and then it's ready for paint and chrome. I started this project over a year ago, and been working on it off and on. I took over a project from a guy, but I got rid of all of the parts except for the frame. From that, I went my own way. I got some inspiration from Billy Lane and 32choppers but it's mostly a result from my own imagination. I live in the Netherlands in Europe and although parts are available (in the Netherlands and Germany) I did a lot of shopping in the USA because there is more available and prices are better (stronger euro vs. the dollar). So I went on and bought a twisted choppers springer front end (the frame is also from twisted choppers), wheels from Arlen Ness (300 rear tire) and a baker transmission. Got an S&S 113ci and some other parts in Germany and the rolling frame was ready. I do like to make most of the parts myself but I'm limited in space and equipment. I literally built the bike in my back yard and a 4 x 2 shed. tools and some elbow grease. But I guess the rewards are far greater this way. Anyway, I did make some parts myself like the handlebars (not in the picture), oil tank (under the transmission), seat pan, fender struts, battery box, brake caliper bracket, and adjusted the tank. I'm also going to change the forward controls (make a new shift and brake lever). 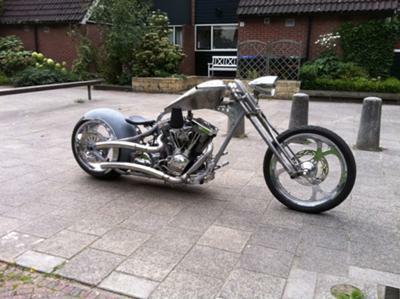 And I’m building my own springer front end, but it will be for a next bike. The 113 inch is a little bit over the top, I could have done with a 96. But I really won't complain. I have a super G carb to go with it but I’m thinking about swapping it for a super E which makes starting a bit easier. First let’s see how the super G is doing. Switching between G and E doesn't require any adjustments on the bike so it can be done once the bike is finished and up and running. The bike is going to be painted black and candy apple red, with some gold leaf on the black. Should look awesome with the chrome pieces. The primary cover is going to be painted wrinkle black, like the engine. There's only one thing I don't have and that's a cool name for my bike. I don't think it's necessary to name the bike but if I have a really good one, why not. So if anyone of you fellow bike builders have a suggestion, I would like to hear it. 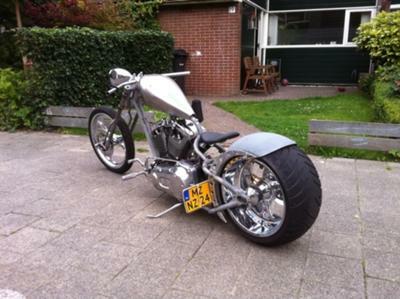 Comments for I Built This Chopper In My Shed With Hand Tools! Ok let me go on record and say I am officially jelous! 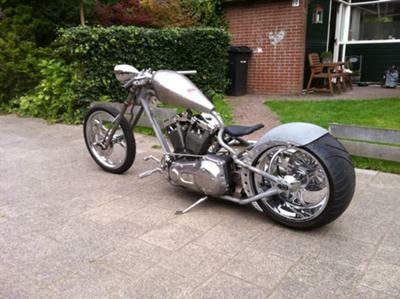 That bike is freakin' awesome! No one would ever guess it was made wit hhand tools. 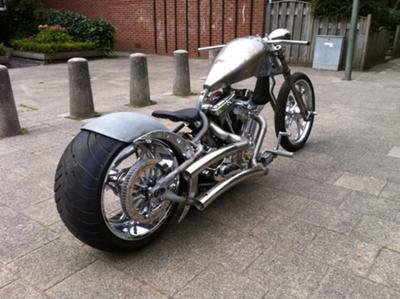 Looks like something from OCC. I wish I had such talents.